What is a slab roller and why you should use one? Forget using a good old-fashioned rolling pin and measuring sticks; a slab roller could be a welcome purchase for potters who are hand building and using mold. Essentially a slab roller is a machine that can turn a lump of clay into a smooth, even flat slab that can then be used for anything from making ceramic tiles to making a bowl or plate in a mold. The benefits of using a slab roller are numerous, firstly, they save your back and arms in muscle power and also stop you having to bend over rolling all your work out with a rolling pin. Secondly, they save you time, as you just turn the handle of the slab roller as it rolls along the clay (they work similarly to an old clothes mangle would in wringing out water from wet clothes). The clay gets rolled much faster and more efficiently with a slab roller than it would if you were rolling by hand. Another great thing about slab rollers is that they can handle much larger amounts of clay than you would be able to, by rolling by hand. And most slab rollers are adjustable; this means you will be able to set the exact height you would like your slab to be. So you can make ceramic tiles in varying thicknesses. What to look out for if you’re buying a slab roller? There are some beautiful slab rollers on the market in a varying price range and a huge variety of places that sell them. You should think first about whether or not you want a tabletop slab roller, which is a great consideration if you are restricted by space as they can be easily stored away. 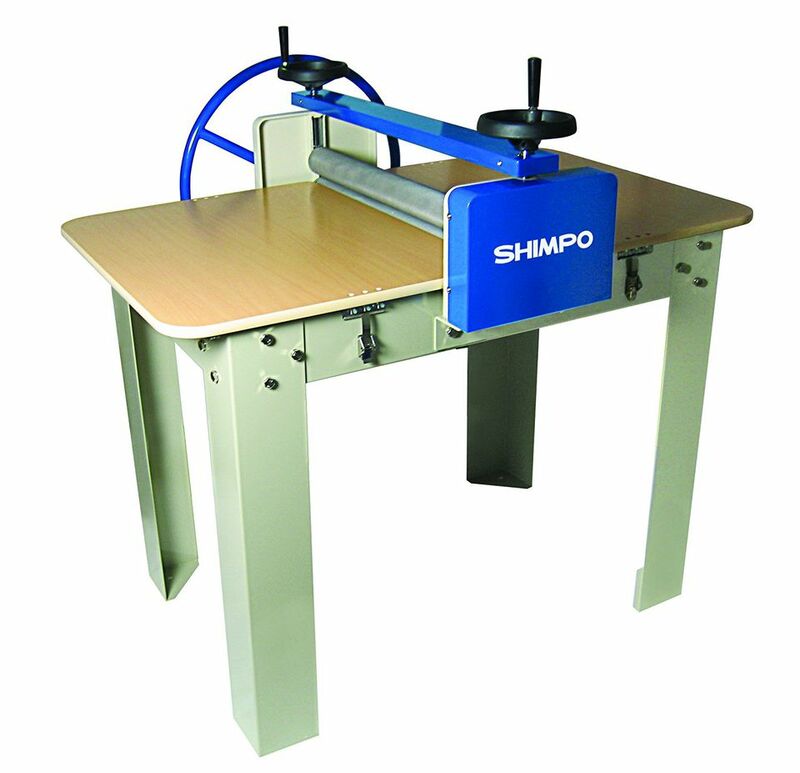 A slab roller with a table top can also double as a work surface in most cases. Most of the slab rollers you’ll come across are operated by a ​hand wheel mechanism (usually one that’s on a rack and pinion track). The majority of slab rollers roll across the top of the bed (or tabletop), while some come with two rollers and the clay is flattened between the two. The higher in price you go with your slab roller, the more heavy duty a piece you will get. You should certainly consider this when deciding how much use you’ll be getting out of the slab roller. Daily use for rolling slabs in large quantities would be better suited to a heavy duty roller rather than just a table top roller which would work better for an infrequent slab building. Slab rollers can be on the pricey side and with the right tools and ingenuity; you can also create your very own slab roller to use in your pottery studio. For example, use a couple of wooden sticks, cut to square and the same size (ones you can pick up for a couple of dollars). Then mark them up with a measuring tape, making lines across both for the exact height you want your slabs (use a band saw to cut the wood). Finally, make cuts where each of the lines are. The reason for cutting the sticks is so that he can slot in a wire cutter, think the exact one you would use to cut your clay. The handles of the wire cutter will sit on the outside of your sticks, creating a type of handle for you to hold. Then you’ll have to prepare your clay, by wedging a huge pile of clay and placing it on the table. Make sure the clay has been properly wedged and pounded. Then you take your handheld slab cutter and holding it horizontally, cleanly cutting a slab through the clay. Then you just move the wire down to the lower notch and run it through the clay again. Continue this process until you have a whole pile of slabs.